Consider this little story. On a planet somewhere far away there’s a community, the Tragic. The Tragic are deeply moral, in the sense of caring deeply about doing the right thing, even when that isn’t in their self-interest. They are also very successful in figuring out what’s the “right” thing, in their sense of right. So they very often do what’s “right” in their sense. Perhaps in both these respects they are better than us. Another difference between them and us, more importantly, is that their “right” doesn’t mean what our “right” means. It is true of different actions. In what follows, I will call their concept right “right”, their concept ought “ought”, etc. For purposes of illustration, suppose that their “right” is actually true of some actions you would find quite odious. For example, it may be the brutal sacrifice of a small child for the sake of some supposed greater goal. There’s a clear sense in which the Tragic really seem tragic. Even if they are moral in their sense, they often fail to perform what we judge to be the right actions. Since they use the wrong concepts, we may well pity them. Who are the pitiable ones, we or they? The situation is symmetrical, for all that’s been said. Evaluating matters using our concepts, they seem tragic. Evaluating matters using their concepts, we seem tragic. Who seems pitiable depends on what concepts are employed. The Tragic is of course a merely fictional community. But the example of the Tragic serves to illustrate a basic point. Our normative concepts are arguably just some of all the possible normative concepts there are. Using our actual concepts, we can judge that it would be misguided to use certain other possible concepts. But similarly, from the point of view of someone who uses other normative concepts, it can seem misguided to use our concepts. Which concepts are the proper ones to use? Ordinary moral theorizing, of a familiar kind. tries to figure out things like what’s good and what’s right. Attention to alternative normative concepts shows that this isn’t the end of the story. There’s also the question of which concepts are the proper ones to use. If our concepts of good and right aren’t the proper ones to use to guide action, then the investigation into what’s good and right doesn’t have the significance that ordinary moral thinking invests it with. Finding out what’s good and right doesn’t settle how to act, for maybe other concepts are the ones we ought to employ when settling such matters. So far I have emphasized the possibility of alternative normative concepts, and the importance of this issue for thinking about ethics. But there’s a problem with how I have presented matters. Some may be inclined to take this problem as reason to simply dismiss the problems I have raised here. I think on the contrary that the problem just shows the depth of the problems raised. Faced with the possibility of alternative concepts, it is natural to wish to ask the questions I have raised. 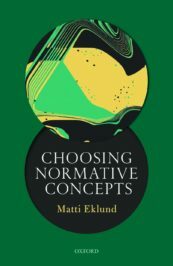 Which normative concepts are the proper ones to use? Ought we to abandon our normative concepts in favour of some alternative ones? But normative concepts are used in the very statement of these questions. And it’s my “proper” and my “ought” that I use (and for that matter my “pitiable” and my “tragic”). But if I frame the questions using my normative concepts, I use some of the concepts that are being questioned, and even if the answer to the question as posed is yes, what can I reasonably do with such an answer? It may be like a corrupt administration asserting its own legitimacy. And of course the problem isn’t avoided if one instead were to use “ought.” The supposed issue of what concepts are the proper ones to use threatens not to be statable. Whenever we try to state what the issue is supposed to be, we fail. There are different possible reactions to this. Let me close by just briefly mentioning some. One is to say that there is no issue of the kind I have been after: there are facts about what’s right and good, and also facts about what falls under alternative normative concepts, but the idea that there’s a further issue about which concepts are “proper,” in some objective or neutral sense of “proper,” is misguided. Another reaction is to seek to find some way of stating the supposed further issue after all. A third reaction is to say that while there’s this further issue, it’s impossible to express what this further issue is. My whole tendency and I believe the tendency of all men [sic] who ever tried to write or talk Ethics … was to run against the boundaries of language. This running against the walls of our cage is perfectly, absolutely hopeless. Featured image credit: Peter Brueghel the Elder, The Tower of Babel, 1563, Kunsthistorisches Museum, Vienna. Public domain via Wikimedia Commons. Matti Eklund is Chair Professor of Theoretical Philosophy at Uppsala University. He received his PhD from MIT in 2000. Previously he has taught at University of Iceland, William Paterson University of New Jersey, University of Colorado-Boulder, Harvard University, and Cornell University. He is the author of Choosing Normative Concepts (Oxford University Press, 2017). We have the Tragic among us. E.g., female genital mutilation. and good is relative to the person, so let people do as they like with limits on harming others. Anthropologists have been describing these alternate realities for over a century, so there is plenty of non-hypothetical and non-trivial material to use. And for the past several decades, the traditional intellectual stance of cultural relativism has been a central issue in moral and ethical stance of the profession. You are recommended to look at the extensive literature and the problem of objectivity in cultural description. But language per se is not the issue — it is the use of language in expressing, defining, and transmitting cultural norms, and its effects on constraining and determining community norms of right/wrong behavior. What high-flown nonsense this is. Don’t waste your time trying to find anything of substance here. Kantians need not apply ! It’s good to digress from conventional norms.